07/11/17 - We are out of pins and will have them by August 12th. If you order now, please note there will be delay in shipping. Does having your krink's dust cover in the way when you are working on your weapon drive you nuts? If it does, you are like me. I have a Yugo M92 and developed a quick release pin for it. 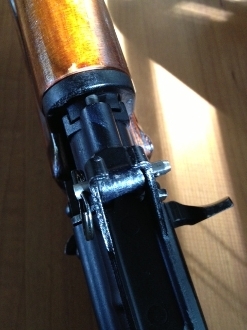 We found that the pin was too long for Bulgarian and Tula krinks so I had shorter pins made just for those two weapons. The pins are made from 303 stainless with a black oxide finish, are 0.156" in diameter and have a working diameter of approximately 0.70" (that's the distance from the pull ring hole to the ball bearing detent). The diameter is an exact match for the hole and keeps the dust cover nice and stable. You install it by first removing your original pin. These pins are peened over a washer/spacer on the right side (the same side as the ejection port and charging handle) so you will need to use a dremel or other method to remove the peened over portion and then a punch to pop the pin out. That's all there is to it. You can then push our pin in. Keep an eye on the little dustcover and gas tube retainer cylinder as it can slide out when the pin is removed.